If I had to make a ‘Top Ten’ list of activities I enjoy most, going to the Farmers’ Market would definitely be one of them. Come Spring and Summer I become transfixed by the vivid and abundant displays of produce and flowers, the luring smell of street food, and the sounds of live music. A total sensory feast! Moreover, I love the idea of supporting local farmers selling their farm fresh seasonal fruits and vegetables. Then, when it is all over, I love to go home and see what kind of meal I can create. 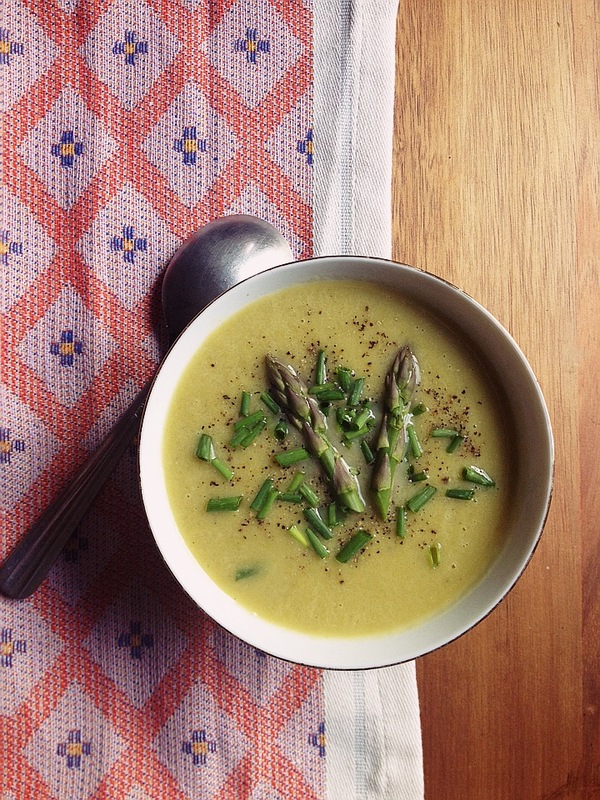 To celebrate asparagus season, I wanted to share my recipe for Leek and Asparagus Soup. Asparagus is the star of this savory and anti-inflammatory soup, with some help from friends of the allium family, including garlic, shallots, leeks, and chives. A good source of fiber, asparagus is also a nutrient-dense vegetable that is high in folic acid; it is also a great source of vitamin C, vitamin A, vitamin K, potassium, and B vitamins (Murray, 2005). Spring is feeling pretty chilly right now near San Francisco, so this soup is my new favorite way to warm up! In a large pot, sauté shallots, garlic, and leeks with coconut oil (or ghee) on medium heat until shallots become translucent. Add the chopped asparagus, sea salt, and broth; then bring to a boil. After soup is brought to a boil, reduce heat to a simmer until asparagus is soft and tender, approximately 20 minutes. Remove soup from heat; use immersion blender or transfer small batches into the blender and blend until smooth. To serve, top soup with chopped chives, freshly ground pepper, and even some asparagus spears if you are feeling fancy! References: Murray, M (2005). The Encyclopedia of Healing Food. New York: Atria Books.